Japan and the U.S. will need to carefully calibrate their response to China’s new Air Defense Identification Zone. Beijing’s creation of a new Air Defense Identification Zone (ADIZ) is the latest challenge to Japanese control of the Senkaku (Diaoyu) islands. More significantly, it fits into the rollback strategy against the American military dominion in the western Pacific. The ADIZ move is not confrontational compared to the intrusions of Chinese government vessels into Senkaku territorial waters, although if the PLA Air Force were to take hostile measures in international air space against foreign aircraft, the consequences would be more serious. So far, it has not. Japan and the United States can respond in several ways. They can take a minimalist approach. This entails refusing to comply with the ADIZ for military and official (such as coast guard) aircraft, but otherwise abstaining from action. A maximalist approach would make life harder for Chinese airlines in Japan and the U.S. (inspections, delays at immigration, tedious security checks for the crews), embargoing critical U.S.-made spare parts for Chinese Boeing and Airbus jetliners, and so forth. The Korean angle is important in calibrating the U.S. and Japanese response. The Chinese ADIZ threatens Korean maritime claims. But the Republic of Korea (ROK) is vulnerable to Chinese pressure, both politically on account of China’s ties with North Korea, and economically. This makes it harder for Seoul to take a hard line, though it did not hide its opposition to the ADIZ. It is easier for the U.S. and Japan to forge a “common front” with the ROK if they adopt a firm but mild attitude towards China. 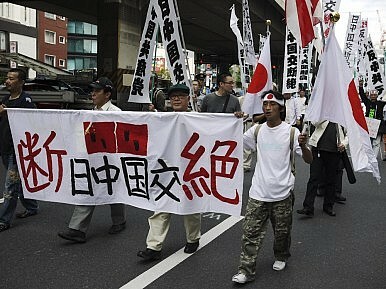 Additionally, Korean displeasure at China may open the door to an improvement of Korea-Japan ties. This will not happen quickly given the poisoned emotional politics of this relationship, but it should affect U.S. and Japanese calculus. A “soft” response to the ADIZ episode does not preclude beefing up the U.S. and Japanese militaries. China’s moves also provides further assistance in developing a broader anti-PRC coalition for the U.S. and Japan. Numerous countries in China’s neighborhood, including perhaps Russia, worry about Beijing. However, they wish to avoid confronting it if at all possible. If they perceive Washington and Tokyo as being warmongers, they will not cooperate with them. However, if they think that the U.S. and Japan are geared towards appeasement, they will kowtow to Beijing. Hence the importance for the U.S. and Japan to invest in their armed forces, but to do so calmly. The Middle Kingdom is undergoing an unfinished metamorphosis that began more than a century ago. It may yet end tragically for everybody but this is far from certain. Fortunately for the U.S. and Japan, China is far weaker than the West. Growth has made the PRC highly vulnerable. The People’s Republic is integrated into trade routes that are at the mercy of the U.S. Navy and Air Force and their allies. Chinese require raw materials and technology imported from U.S. allies or areas the U.S. can control. The U.S. and its partners can confiscate many of China’s overseas securities and property. The children of the Communist Party ruling strata (as well as many spouses) are living in luxury in North America, Australia, and the U.K., ready to be interned as enemy aliens. Comparisons with pre-1914 Germany are mistaken. China is less stable than Germany was on the eve of the Great War. The Kaiser’s realm was then the most scientifically advanced country on earth, which China is not. Finally, the German elite took seriously its duty to serve emperor and country. There is no indication that the children of the rich and powerful in China want to give up the pleasures of Western campuses followed by the rewards of global finance for the honor of wearing the PLA uniform. Moreover, China is less dangerous than the late U.S.SR was. Moscow wanted to exterminate capitalism from this planet, making muscular deterrence and sometimes offensive action the only option. Its militarized economy created a formidable Eurasian force despite relative penury. Its autarkic system was relatively invulnerable to anything but the application of crushing power against the Soviet homeland itself. Clausewitz wrote: “war most closely resembles a game of cards.” The game with China – which is not a war for the time being – is one where the U.S.-led alliances hold a stronger hand, but they will still need to play it well if they are to prevail. Why Rex Tillerson Must Bring Up Human Rights on His First Asia TripTrump Faces Early Foreign Policy Test With Abe MeetingThe Lessons of Pearl Harbor: Fear Itself, Then and NowHillary Clinton’s China PolicyWill the U.S. Really Defend Japan?